There are many fascinating animals in this world as you may have noticed. But none are more interesting, beautiful or “cute” as Kirk’s Dik Dik (Madoqua kirkii). It is the smallest antelope native to eastern Africa, one of four species of dik dik antelopes. Males weight anywhere between 10-12 lbs with females a few pound heavier. They stand only 14-18 inches high. By contrast, the Giant Eland antelope can weight 2000 lbs and stand six feet at the shoulder. So, Kirks Dik Dik is a really small guy. Only the males sport horns, usually only about 3 inches long, like this guy. Dik Dik’s are dainty creatures with a pointed snout, large eyes and ears (for hearing and seeing predators), pipestem legs and “hare-like” hind limbs that are larger than forelimbs (the better for running). If you were this cute you might presume that you would be safe from predators. Not so. As you might imagine, in Africa (and throughout nature) everything preys on something else and almost everything on the African plains eats Dik Dik’s, when they can catch them, that is! Kirk’s Dik Dik is highly adapted to surviving in the arid regions of eastern Africa. For one thing, they (like other Dik Dik species) have a hairy proboscis (nose) with tiny slit-like nostrils. This proboscis contains an enlarged nasal chamber with a rich supply of blood vessels that allows rapid cooling of circulating blood by way of rapid panting. That is a distinct advantage when you are trying to outrun a predator. The process also results in minimal loss of water, another survival advantage in arid climates. Dik Dik’s are highly nocturnal. Makes sense to come out and graze at night under the cover of darkness if most everything considers you a nice snack. They prefer habitats with good cover but not tall grass that they cannot see over. 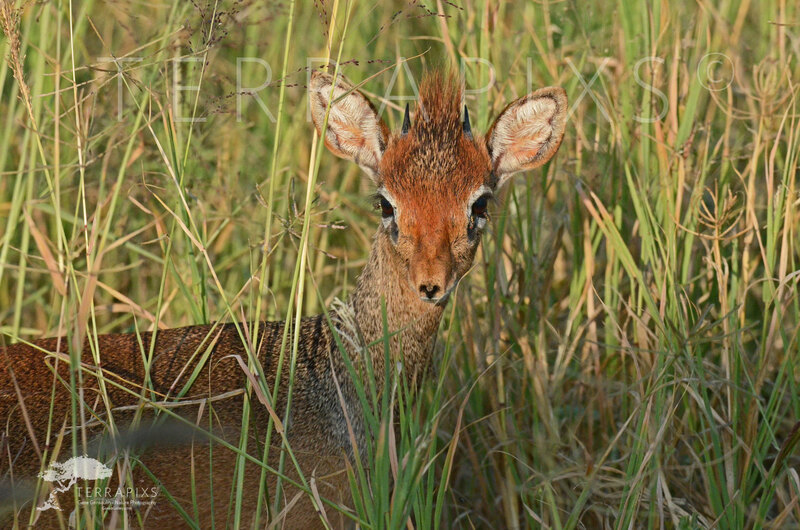 When in danger, Dik Dik’s tend to freeze and hunker down where their color blends superbly with their background. They can run though, up to 25 or so mph and are highly mobile. The life span of Kirk’s Dik Dik in the wild is usually 5 or so years, rarely 10. The male in the picture was hard to photograph. It was late in the day and he was just beginning to stir and was vary wary. The 600 mm lens brought him in close enough but it was only when I made a clicking sound that he looked up for the pose. By the way, today people are the Dik Dik’s biggest threat as they are hunted heavily, their small bones used in making jewelry and their skins made into suede for gloves. It is long since time that we stop such unwarranted destruction of these and other wild creatures. Use your buying power to help conserve and protect our precious biodiversity. The world is awash with alternate man-made products that serve the same purpose. So, enjoy mother nature and protect her for she is all we really have.